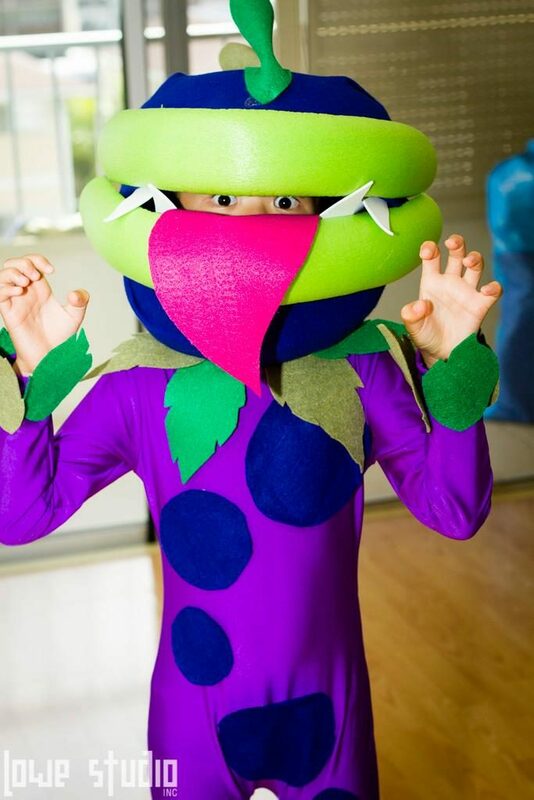 My child’s been involved in a couple of youth theatre experiences lately. It’s something he seems to show a liking to and we’re seeing how far it’ll go. Will he be future movie star? Perhaps…right now I don’t see a lot of asians represented on TV and screen, but maybe by the time he’ll be of age that will not be an issue. Anyhoo…one thing it seemed we’ve involuntarily been shuffled into was the role of costume designer. 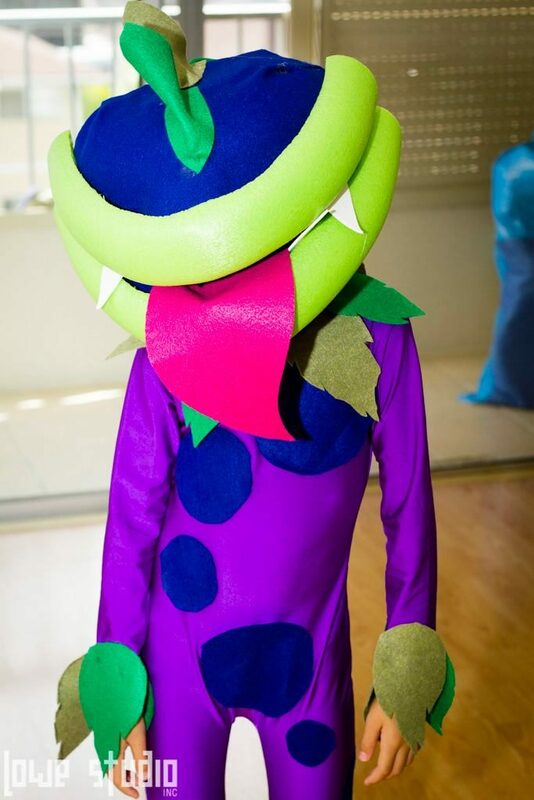 This year their theme has something involving video game characters for his play….he ended up choosing to be a Chomper from Plant vrs Zombies. 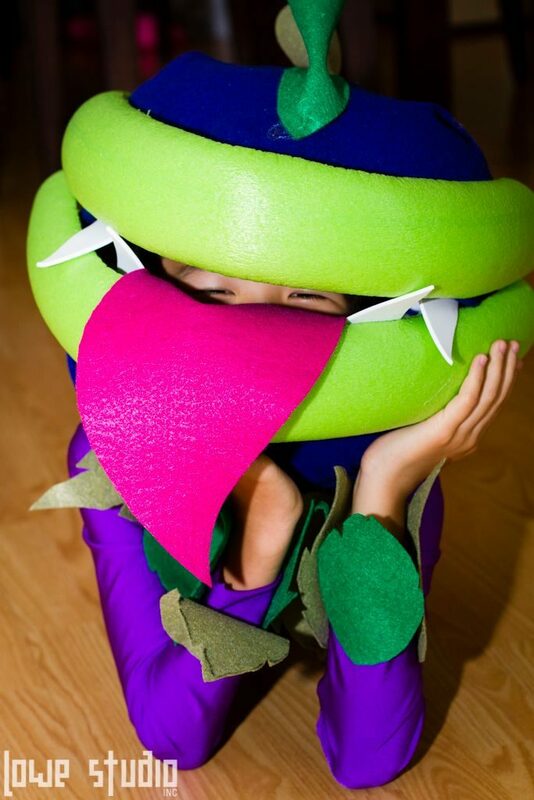 If you haven’t played that game, it’s basically just a walking venus flytrap. 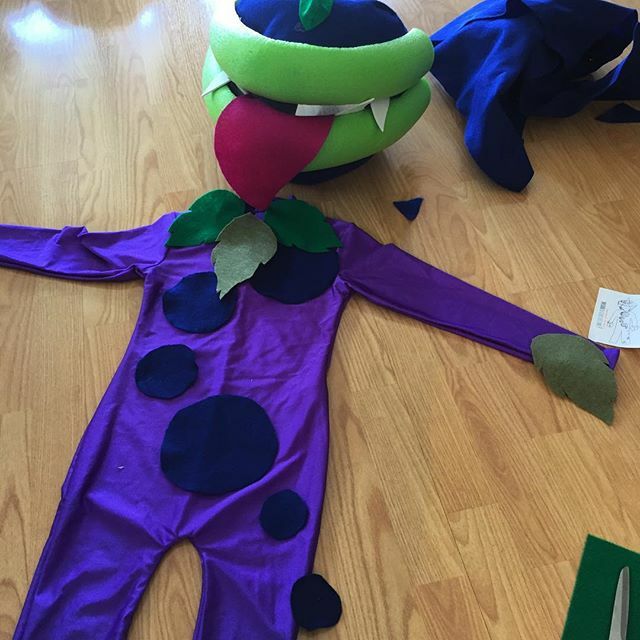 Mind you, beyond a simple Jack and the Beanstalk costume we made for him last year, my wife and I have never built costumes before. 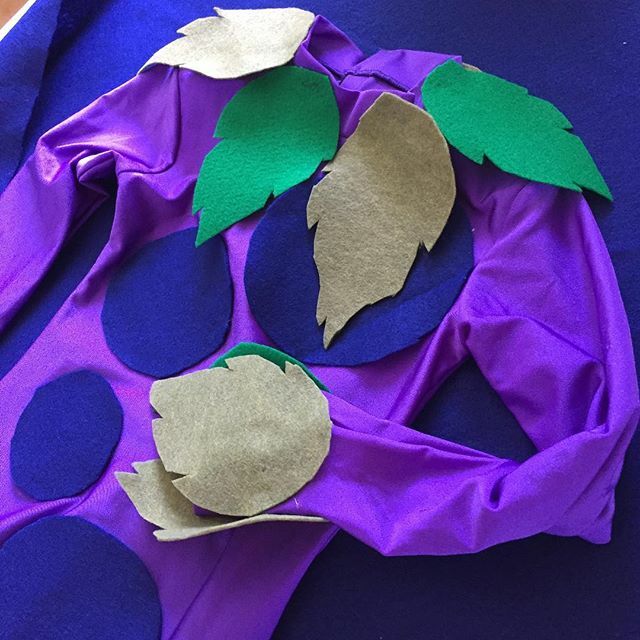 I never picked up a glue gun nor reliably worked with felt and materials. So I was a little bit apprehensive when I told the boy “Yeah, sure we’ll see if we can make you a costume”. First thing we did was jump onto Google to search for any ideas. There were some. This particular version gave us the best tip moving forward. The colander idea and the big floaty tube lips was a big help. It gave us the funniest moment when we were at Walmart trying on colanders on his head….people were giving us really funny stares. 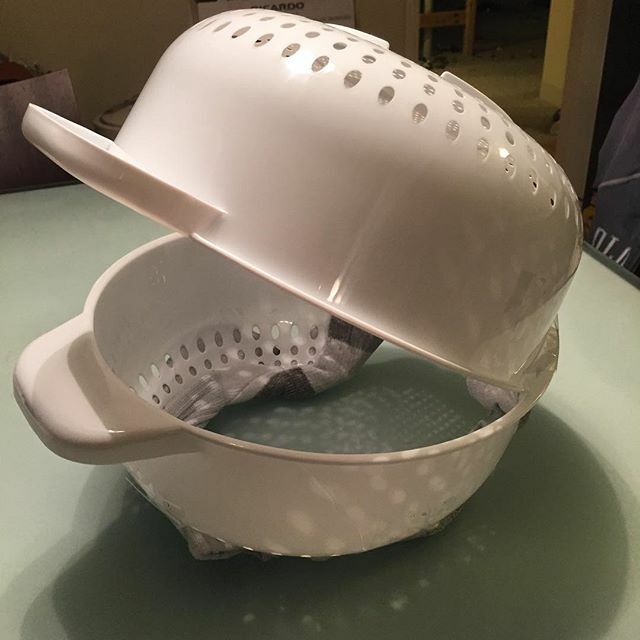 Two cheap plastic colanders. I basically smashed out the bottom half, taped the two ends together and padded the bottom with old, clean socks. Wrapping it wasn’t easy. I think we made a bad choice choosing felt to wrap the thing…perhaps plain cloth might have been easier and smoother around the shapes. 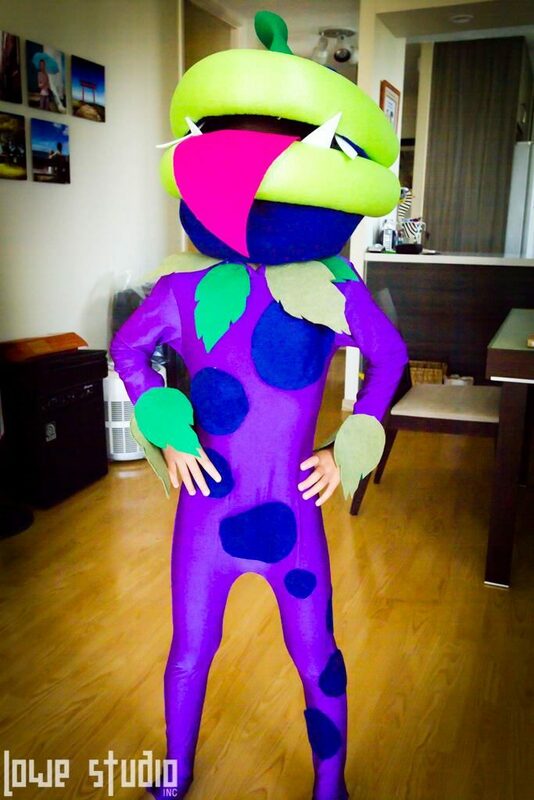 Rather than sew a suit, I suggested we buy a purple unitard from Amazon. It worked, but the purple didn’t match. 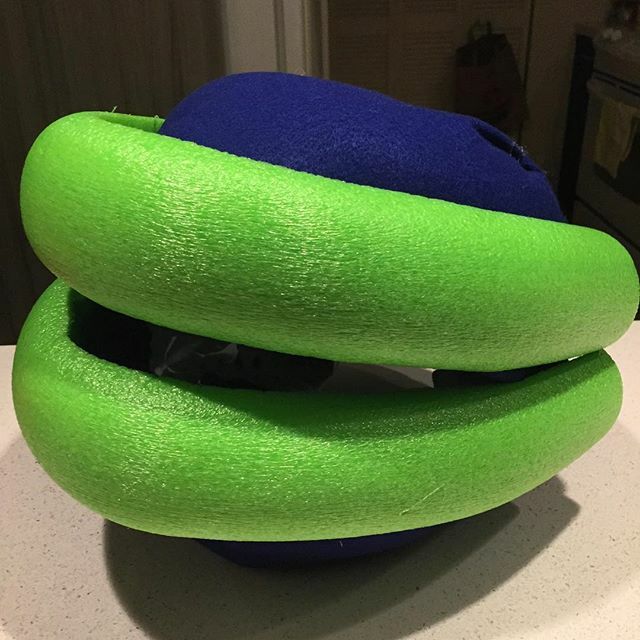 I took the extra scraps from the head material and designed a pattern going down the suit. The end result turned out pretty good I’d say. The colors all work well together and it’s apparently a hit with the other kids in the play.